Welcome to Hakim Oriental Rugs. 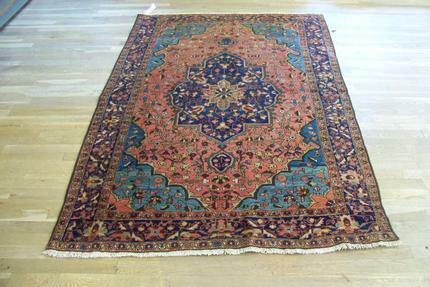 Your source for the finest oriental, one-of-a-kind rugs on the internet. Please browse our website to find the rug that you are looking for. If you need help, or are looking for something more in particular, please feel free to contact us. We are always ready to answer any of your questions. We’re truly inspired by the beautiful women of Hollywood stunning gowns from last night’s Golden Globes. Among the sea of solid reds, exciting turquoise, and classic black and whites we notice new two other major trends: color blocking and texture. Stars like Taylor Swift, Julie Bowen, Aubrey Plaza, and the stunning Sandra Bullock all displayed the two-toned look in their own way. Our favorite, featured below, Sandra Bullock was dressed up in a satin gown from designer Prabal Gurung pre-fall 2014 collection. Even with its pops of pink and blue, the classic black made the dress feel understated and gorgeous. Ornate. Intriguing. Whimsical. Are some words that come to mind when we think about the striking textures we saw on the red carpet last night. From Zooey Deschanel in Oscar de la Renta, to Cate Blanchett in Giorgio Armani, there was a feeling of light and airy even in the most intricate of textures. Copyright © 1975-2019 Hakim Oriental Rugs. All Rights Reserved.